The exhibition in the former administrative building of the "Reichsbahn" (state railway in the Third Reich) shows the urban development of selected cities located along the river Rhine from 1910 until 2010+. The focus is on legendary planning, protagonists and places that have characterized the past 100 years of urban development history. In three chapters – rhine:travel, city:change, future:outlook – it is told of transformation and urban visions. The kick-off of the show is composed of a terrain graphic, overlaid with scanned historic maps, illustrating the course of the Rhine from Bonn to Duisburg. These projections visualize in chronological order the evolution of the settlement structures and take the visitor on a voyage in time. With a look to the top, the current panorama can be seen on a photographic illustration. 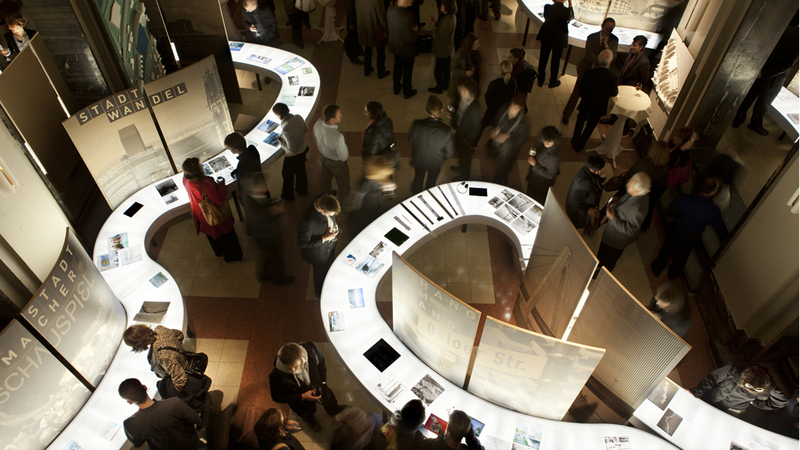 The 12 exhibition themes are presented in a 60-meter-long showcase flowing through the room as a stylized river. The installation is composed of two different, modular bodies of radius, which permit the adjustment to changing spatial situations. Along the »river« vertical information plates structure the contents and make the exhibition architecture become an accompanying landscape. The plate surfaces are rough screen, large-area prints with picture motifs, and thus create a visually attractive »theater playbill«.